Why start a blog? Reason number 17. Financial Security. Brief story-time. In Fall 2015,’ I suffered from a work-related incident that left me unable to perform my full-time duties. While out of work, I actively pursued other forms of employment. I interviewed a bunch and was finally hired in November 15.’ Excited and looking forward to the new position in the new year, I was content. I stopped actively looking for a new job. January 2016′ came around, and I was to start my new position at the end of the month. Yay! Right? Wrong! Less than one week before my start date. I got a call from my future (EX) boss to be, that the higher-ups decided to go in a different direction. Feeling helpless, deflated and perplexed by the realization that, my future income was taking away from me. In that moment when she called, I made the decision to never give someone full access and control over my financial life. I began doing some research (kinda of) on how to make that happen. I fell upon blogging and has changed my life. Blogging has allowed me the luxury to stay-at-home with our daughter without being a financial burden to our household budget. Money isn’t everything. However, the extra income from my blog is allowing my family to completely design our days. That’s HUGE for us. Today, we want to walk you through how to set up your first blog and get you on your way to designing your own life! Click here to start a blog with Bluehost, then use the tutorial below for easy step-by-step directions. What Are The Benefits Of Starting A Blog? “There’s no time like the present.” We’ve all heard that saying before. It rings true for starting a blog. One of the fantastic things about blogging is that you can write about absolutely anything; hobbies, lifestyle, children, school or work. Sharing your experiences and viewpoints on life. Starting a blog will help you become a better writer, join an online community of other bloggers alike while inspiring others. Connect with brands that you love and promote for FREE and might get paid for it. Best part you’ll design days that you love while earning an income. The benefits of blogging are endless. Starting a blog was one of the best decisions of my life. Our Daughter is 10 months, she’s turning 1 in March. I started my blog to earn an income from home so I can better take care of our family while not causing a financial burden to our household budget. I am blessed to be able to do. With a lot of long nights and hard work, I am able to do so. Anyone can launch a successful, profitable lifestyle blog. The business of blogging is like no other. Low startup cost. And very low overhead. No educational or technical experience required. All you need is the dedication and the willingness to put in the work. When I started blogging I knew nothing about hosting, WordPress, or themes. Driven by excitement, and the support of my Husband. My blog was born. If I can do it, you can too! Seriously! If you’re interested in starting your own blog, I created a free 7-day email course to help you start a blog and learn how to make it successful. You can join below! In my honest opinion to run a profitable and successful blog, it needs to be on a self-hosted platform. While the option of starting a blog on a FREE hosted platform sounds may good. But, it isn’t. Reason 7,001 – It isn’t profitable. I’ll tell you why 99.9% of profitable blogs don’t run on FREE host sites and why you should not use them. It’s ugly. The customizations are limited. If you’re interested in making money from your blog, freelancing or turning your blog into a business, then paying for your hosting (such as through Bluehost) is a MUST. It’s extremely affordable, has outstanding customer service and you can run any of your own advertisements, affiliate links, product sales, etc. 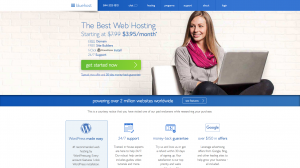 with a blog using Bluehost. Because of these grossly noticeable flaws, this is why I always recommend Bluehost to anyone who wants to start their own lifestyle blog. Bluehost offers so many benefits when you host with them there’s no reason not to start a blog. Thanks to their 30-day money-back guarantee, there is a very little risk of starting a blog through Bluehost, and a lot of potentials to make money blogging. If you are currently using a free blogging platform, you can easily transfer your blog to a self-hosted site. The process of starting a blog can be a bit daunting and overwhelming. But, start anyway! The one thing that all successful bloggers have in common, is that they started a blog. Today, not tomorrow. But, right now. that’s the difference between everyone else. Success starts when you start. By starting your blog.You’ll be ahead of anyone else who is still thinking about launching their blog yesterday. Do it scared. 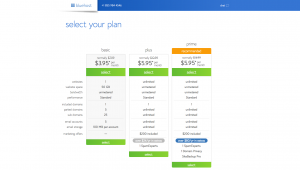 You can click the green Get Started Now button at Bluehost to get started. I recommend choosing the Basic starter package as that’s really all you need and it’s a great deal at 50% off the regular price! How do I select a good domain name? I had a hard time coming up with my blog name. I overthink the entire process. Don’t be like me, relax remember not to overcomplicate it. In the long run, the value of your blog is in the content that you put into it. Not the name. PRO TIP: I recommend registering your name through Bluehost since it keeps everything streamlined, and you get a FREE domain name if you purchase a 12 month (or longer) blog hosting plan (a $15.99 value). You can get your domain directly through Bluehost for FREE when you sign up for at least 12 months worth of Bluehost web hosting. 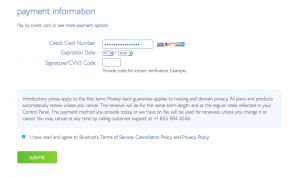 This is one of the many benefits of hosting with Bluehost and why we recommend it. Once you’ve chosen your free domain name, the next step is simply to fill out your contact details and payment information. Some of the boxes on this page may already be checked, but the only option that we recommend is the “Domain Privacy Protection.” Adding this feature ensures that your personal information as the website owner remains private. Hit submit, and congrats! You now own your very own website!!!!! We SURVIVED! Not to bad, right? Note: If you’re registering a free domain name, you can skip the next part and head straight to Step 4 to install WordPress. Already have a paid domain name? If you already have a domain name that you bought from a website like GoDaddy, you will need to connect it to your web hosting account. 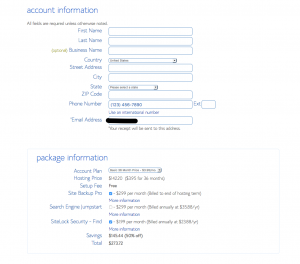 It’s easy to connect your domain name to Bluehost, just choose the second option on the page instead of registering a new domain name. Follow these instructions to connect your GoDaddy domain to Bluehost. From the Domain Name drop-down menu or the Manage Your Account list, select Manage Domains. Using the checkboxes, select the domain name you wish to modify and then click Set Name Servers. You will then need to select the domain name you bought (such as through GoDaddy) as an Add On Domain through your Bluehost cpanel. Click on Domain Manager, then select “Assign a Domain to Your cPanel Account”. Follow these steps and it is very easy! 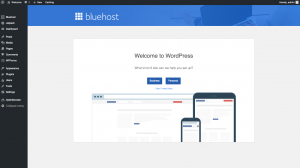 Since you have now purchased your Bluehost hosting package and chosen your domain name, the final step is to Install WordPress. 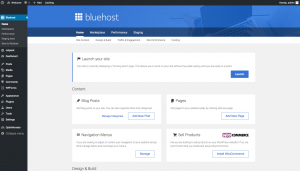 Bluehost just made it even easier to create a WordPress blog. If you get stuck on any step, you can always send me an email at trueandpretty.com or open Live Chat on Bluehost. You will be asked to pick a theme. 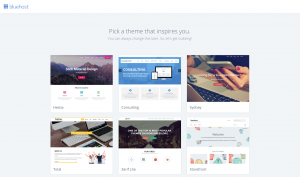 You can choose any theme here, just pick one that inspires you. You can always change it later so it’s not a big deal. There are lots of free options too, so if you prefer to skip this step, just scroll to the bottom of the page and click “skip this step”. After you select a theme, click on “Start Building”. The next screen will ask what kind of site you would like to set up: “Business” or “Personal”. 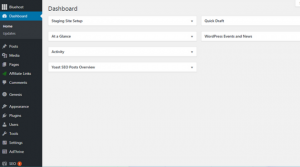 If you want to upload a different WordPress theme, you’ll need to click “Appearance” on the left-hand side of your WordPress dashboard, then select “Themes”. You can also head to premium theme websites, such as StudioPress or Foodie Pro (I love Foodie!) among others and buy your favorite theme. With time, if you get bored with your blog’s appearance, you can simply change themes without affecting your images or content, thanks to the excellent feature by WordPress that allows users to switch themes with a few clicks. For more information about all the blogging tools, I use for? True&Pretty, feel free to check out my Resource Page. If you have any questions about starting a self-hosted WordPress blog, please leave me a comment or send me an email at trueandpretty.com. I’m more than happy to help you, that’s what I’m here for! If you know someone that wants to start a blog or website, please share this tutorial with them!